Second row Andrew Browne is targeting the World Cup period. Browne making hard yards at the Sportsground last week. THEY MAY BE minus Robbie Henshaw and Nathan White, but for Connacht the Rugby World Cup presents more opportunity than misfortune. There’s probably never a good time to take an away trip to your league’s defending champions, but if there is, the week before the World Cup is likely to be it. The Glasgow Warriors are without 20 first team players who have been selected for the tournament, and opened their campaign with a 16-10 home defeat to the Scarlets last week. Pat Lam’s side meanwhile eked out a six point win against the Dragons who – like themselves – have the relative advantage for September and October of having something that resembles their first team. Connacht’s Andrew Browne says that a firm emphasis has been placed on the opening rounds of matches, and making a similar start to their last campaign, where they won four and drew once in their opening six games. “They’re (Glasgow) missing a good amount of players. As we’re not missing that many we have to target these games where teams may not be fielding their strongest team. We have to get points on the board early with this World Cup period. “It’s not just continuity with the team that’s out on the pitch, but throughout the whole training week. Lads know each other inside out at this stage,” he says. While the Warriors have lost key players, the squad hasn’t been gutted. New signing Mike Blair starts and brings a wealth of experience. A backrow of full internationals; Chris Fusaro, Adam Ashe and Rob Harley will test any side. And they also have Scotstoun to fall back on. They may have slipped up at home to the Scarlets last weekend, but 100 percent record at home last season was the foundation for their success. With Robbie Henshaw away and several backs injured, 21-year-old Rory Parata has stepped into the 13 shirt during pre-season and indeed on the opening day of the season last week, and has been picked to start again tomorrow night against the Warriors. The former Rockwell College student excelled in the Ulster Bank League for Galwegians and with the Connacht Eagles last term, and Browne says the academy prospect can only improve from the opportunity, alongside the exciting Bundee Aki in midfield. “I think he had a really great pre-season. To see the improvement on last year throughout the summer was fantastic. He’s fully deserving of his shot in there and if he can keep it going he could be very hard to move. 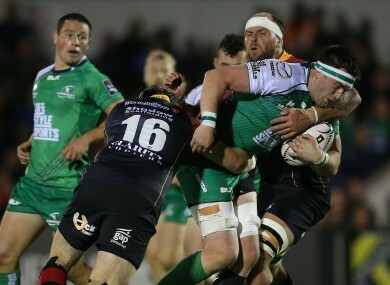 Email “'We have to target these games' - Connacht looking to gain World Cup advantage”. Feedback on “'We have to target these games' - Connacht looking to gain World Cup advantage”.